Will China's new carbon market work? - Unearthed Will China's new carbon market work? 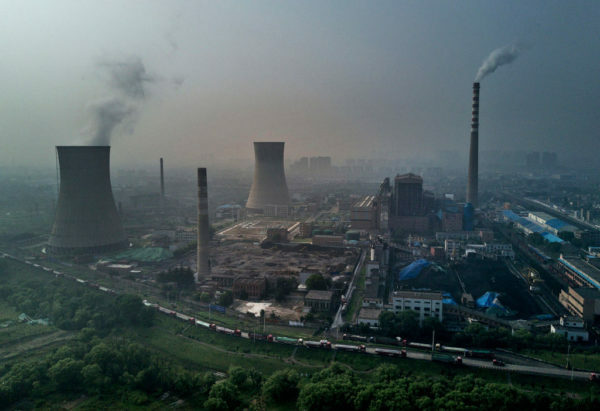 China has announced the start of the world's largest emissions trading system. So why hasn't trading started? Can the market avoid a price crash? And will it actually cut emissions? On Tuesday, China released its long-awaited plan for the world’s largest carbon market. The new system will cap the carbon emissions of polluters by putting a price on CO2 and creating permits that companies can trade, depending on whether they have emitted more or less than their quota. It creates an economic incentive for companies to cut emissions and if implemented successfully could accelerate the shift of the world’s biggest emitter away from coal and towards clean energy. Formally, the system is part of a suite of policies that are designed to help China reach peak emissions before 2030, as part of its commitments to the global Paris climate deal. The EU currently runs the world’s largest operating emissions trading system (ETS), with other national and regional schemes in North America, Europe, South Korea and Japan. But these systems are not being without their challenges. So will China’s carbon market actually work? Why hasn’t trading started already? Although the government has announced the start of the new system, real trading (that is, with money changing hands) is unlikely to begin before 2020. In the meantime, the key elements of a functional carbon market will be established: emissions monitoring, permit exchanges and then simulated trials. Of course, the delay means any emissions gains will be delayed too. Either more time is needed to build a robust market system or this reflects opposition to setting a substantial price on carbon that would favor cleaner economic sectors at the expense of highly polluting smokestack industries. Why is the system limited to one sector? Although the system will cover the entire nation, for now, it will only be run in the power sector, covering coal-fired and gas-fired power plants, including those that produce both power and heat. Even so, this makes up a third of China’s total carbon emissions (approximately 3.3 billion tonnes annually), its largest source. In comparison, the EU ETS system covers approximately 2 billion tonnes, while California’s carbon market covers around 400 million tonnes. The plan states that the market will be gradually expanded to other energy-intensive industries, such as steel and cement, the largest emitters in the power sector. Eventually, it is expected to extend to eight sectors, covering more than 50% of China’s total emissions. But the earliest that sectors could be added is 2021 and there is currently no timeline or clear criteria for their inclusion in the plan. In part, this makes sense. Data quality is better than the power industry than elsewhere as a power plant needs to sell power to the state grid or to a large industrial customer. But this is not the reason given in the plan. It states that other industries have been left out so as to avoid “affecting the stable and healthy economic development”. This might reflect more fundamental disagreements about the timeline and ambition for China’s economic and environmental transformation.. It’s crucial for the regulators to make it clear that these sectors will be included as soon as data issues can be resolved. Can China avoid a price crash? Emissions permits will initially be handed to power companies for free, based on their production capacity. However, such a system can easily create misguided incentives for companies to inflate their output or capacity by keeping old units running or adding new capacity. Provinces and companies would also have an incentive to inflate emissions projections. Governments have a well-known tendency to over-project emissions. Based on experiences from the EU emissions trading system, these are risks that the regulators need to pay attention to. A big problem with Europe’s carbon market is that companies have been allocated too many permits, leading to dirt-low prices and loss of market confidence that the carbon price can support investments. There is a risk here for China too. Power sector emissions vary strongly year-by-year based on shifting demand, operating conditions and economic cycles, so it can be difficult for the regulators to set the carbon price appropriately. If it drops to very low levels, the market becomes unable to incentivise investments in emissions reductions. Is the emissions cap ambitious enough? If the carbon market is to succeed in cutting emissions, this is the biggest question of all. It’s also the hardest to resolve. But the plan includes no details on the level at which emissions will be capped, besides general statements that it will be “moderately tight”. Without a cap set well below the ‘business-as-usual’ emissions level, no meaningful trading can happen. Although China’s target is to reach a peak in emissions by 2030, they have already levelled off in the power sector so setting the cap in line with this target could lead to a very substantial oversupply of emission permits, leaving the market weak and with little potential to push down emissions. Will it affect profits – and emissions? Power prices are regulated in China, so carbon trading will not necessarily affect the profitability of coal-fired power generators, if the cost of emission allowances is passed on to the grid operator (and possibly consumers) through a regulated tariff. All other industries sell their output on the market so an emissions cap would require them to buy additional permits. This would definitely affect their profitability and catalyze an economic shift to less polluting activities. While a strong carbon price and an effective market would propel China’s emission reduction measures, the country’s dramatic shift in CO2 emissions trajectory has come largely from non-market, policy measures. As with many other sectors of China’s economy, government orders are playing a much larger role than market measures at least in the short term, but there can be little doubt that environmental protection goals are taking higher and higher priority in government policy.